SMSF Liquidity requirements are a relatively new feature of most SMSF loans that can reduce your SMSF’s borrowing capacity. To understand how liquidity requirements work – and how you can reduce the impact on your borrowing capacity – we’ll start by defining just what ‘liquidity’ means. In terms of SMSF lending, liquidity or liquid assets simply refers to the available cash or shares sitting in your self managed super fund. Most lenders are interested in making sure that – after settlement – the SMSF taking out the loan will still hold what the lender considers to be enough liquid assets. 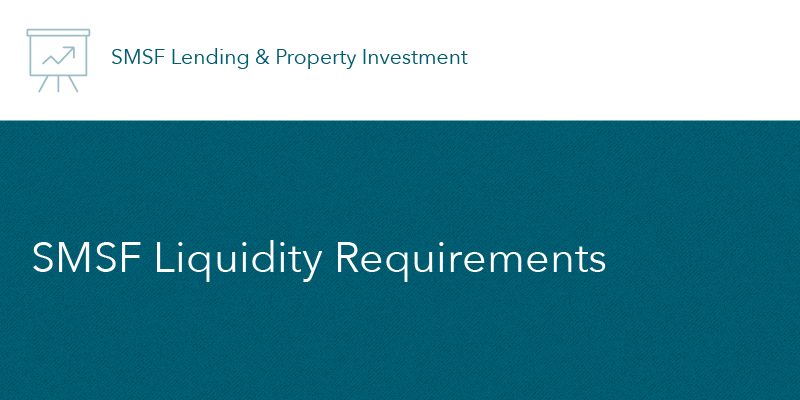 Specific SMSF liquidity requirements vary from lender to lender. We’ll look an example of how this works in practice shortly, but first let’s look at why lenders have put these requirements in place. What’s the purpose of liquidity requirements? With these potential expenses in mind (and having limited faith in trustees’ ability to manage their affairs safely), most lenders have recently moved to include specific liquidity requirements in their loan assessment process. Each lender has set the bar at a slightly different level. Some lenders use a percentage of the overall value of the fund. Others have set a percentage of the loan amount or a percentage of the property value as their liquidity requirement. You can find the current SMSF liquidity requirements for most major lenders at the bottom of this page. So what do SMSF Liquidity Requirements look like with an SMSF Loan arrangement? So 12 months ago, an SMSF with $200,000 was able to use up to the last dollar in its bank account toward the purchase of a property, meaning it could purchase a property circa. $750,000 (20% deposit + settlement costs = approx.. $200,000). The SMSF bank account would show close to $0 balance post settlement. Today, with SMSF liquidity requirements in place, the same SMSF would be required to keep for example 10% of the loan amount in liquidity. This means the SMSF would only be able to purchase a property for circa. $600,000 (20% deposit + settlement costs + $48,000 liquidity = circa. $200,000). The SMSF bank account would show about $48,000 post settlement. How do these liquidity requirements effect my SMSF investments? The inevitable net result of the new requirements is that the SMSF has a reduced purchasing capacity. This in turn reduces the pool of properties that the SMSF can purchase from. It’s important to note that the different benchmarks used by various lenders can have a big impact on an SMSF’s borrowing capacity. For trustees wanting to spend as much as possible on their SMSF property, this could quickly become one of the most important criteria when choosing their preferred lender. Hybrid lending is a particularly efficient way to work around SMSF liquidity requirements when needed. Hybrid Lending occurs when your SMSF borrows some of the funds to purchase a property from a third party. This could mean some of the required funds are borrowed from a bank, and some of the funds are borrowed from a related party – such as the funds trustees. Put simply, a hybrid loan is a mix between a traditional SMSF loan and a related party loan. Find out more about SMSF lending strategies. Using hybrid lending, the SMSF trustees would lend money to the self managed super fund themselves, along with the main lender, to meet the liquidity requirement. After settlement, the SMSF will then be free to pay back that loan with the liquidity that the bank has made it keep in its account. SMSF Loan Experts even have access to one lender which does not have any liquidity requirements, leaving the trustees to decide how best to manage their Self Managed Super Fund. Need advice on how you can reduce or remove the impact of SMSF Liquidity Requirements? Whether you have your own SMSF – or your a finance professional looking for the SMSF lending solutions for your clients – get the right advice from the SMSF Loan Experts. Below you’ll find the liquidity requirements of some SMSF lenders. These requirements are current at the time of publishing. Please use these as a guide only and contact SMSF Loan Experts for current liquidity requirements. 10% of the total assets (including the property and cash / shares) need to be made of cash / shares. This means that the cash / shares left need to be at about 11.12% of the property value. Whether you’re looking for your own SMSF lending advice, or your a financial professional looking for the best lending solutions for your clients, contact us to get the right advice from an SMSF Loan Expert.